Colours: Sugar Rim, Moscato, Martini Olive, Espresso Martini, Maraschino Cherry, Cheers, Caracao, Body Shot, Champagne Toast, Bloody Mary, Bellini, Magnum, Pina Colada & Last Call. 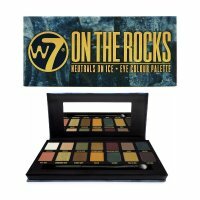 On The Rocks Is An On-Trend Eye Colour Palette Featuring A Range Of 14 Cool Toned Shades. A Combination Of Earthy, Natural Tones With A Punch Of Creamy Golds & Deep Yellows Throughout. The Shades Within The Product Are Blendable With A High Level Of Pigmentation. This Provides The Ability For Everyone To Create Soft, Natural Looks All The Way Through To Striking, Bold Eyes. The Finishes & Textures Vary Within The Palette, With Shades Ranging From Metallic Glitters To Creamy Mattes Shades. The Rocks Have Smooth, Highly Pigmented Mattes, Her Metallic Shades Are Just As Smooth To Apply & Just As High In Quality.